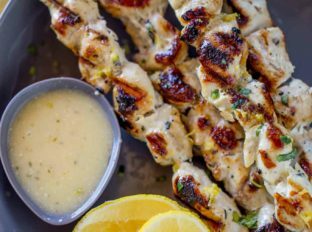 Lemon Greek Chicken Skewers with greek yogurt and lemon marinade is a quick and easy Healthy chicken dish perfect as a main course or for salads and sandwiches. These skewers are a quick main dish you can serve with Tabouli Salad, Greek Chickpea Salad or Baba Ganoush for a perfect Greek meal that’ll make you feel like you’re on vacation. 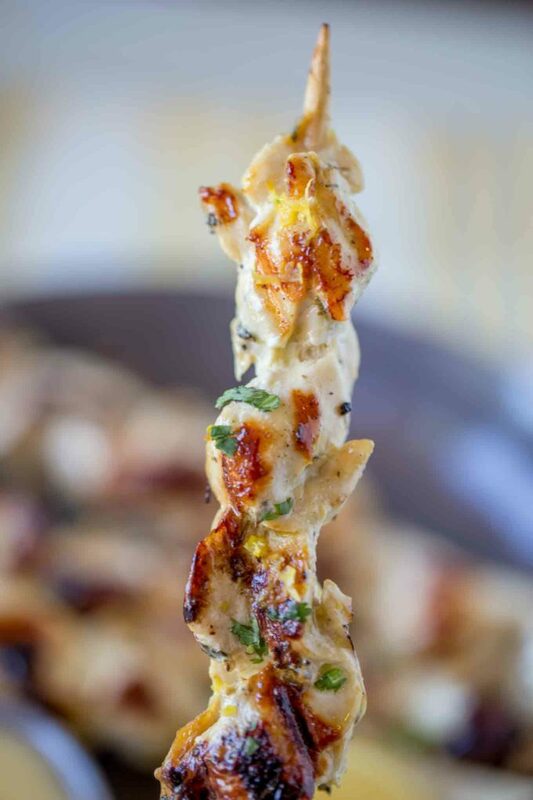 Lemon Greek Chicken Skewers are a fantastically easy recipe to make and they have a boldly flavored marinade which flavors the chicken but also tenderizes it! Growing up my mom was always marinading chicken kebabs in greek yogurt (this happens when your family is middle eastern, we always marinade in yogurt!). Why use yogurt in a marinade? Yogurt works great as a marinade because it helps to break down and tenderize chicken breast so its more tender after grilling. It also acts as a barrier that helps the chicken keeps its moisture. Add in more herbs as you like them. People LOVE rosemary with Greek dishes, I just love the milder lemon flavor in this recipe. 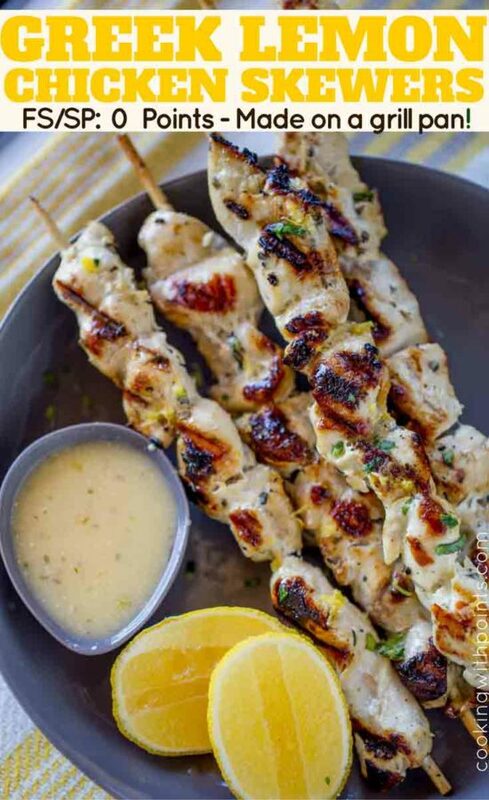 Lemon zest and juice is the best finishing topper for the dish and makes the chicken kebabs taste so fresh. Looking for more Greek Flavored Recipes? Over on Dinner, then Dessert (not a WW blog, fair warning) I’ve got a few for you to check out! Remember Dinner, then Dessert is Cooking With Points’ sister site. I run both blogs but only this one is Weight Watcher recipe focused. Lemon Zester: The perfect zester. None of the pith, pure zest. Soak your wooden skewers in a pan of water. 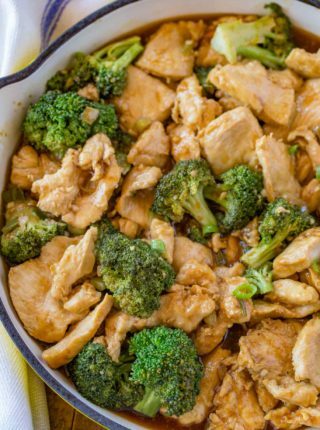 Cut the chicken breast pieces into 2 inch chunks and put them into a large bowl. Add in the rest of the ingredients into the bowl and cover with saran wrap. Marinade for one hour, then thread each piece of chicken onto a wooden skewer (about 6-8 pieces on each one). Cook on a grill, grill pan, or cast iron skillet* over high heat for 2-3 minutes per side. Serve with lemon wedges or fat free Greek salad dressing on the side. Are your recipe SP on this site calculated for freestyle or old smart points? Thanks! What the difference between smart points and freestyle points? Maria, the freestyle system basically uses the same values for smart points except it makes some foods always worth zero points. 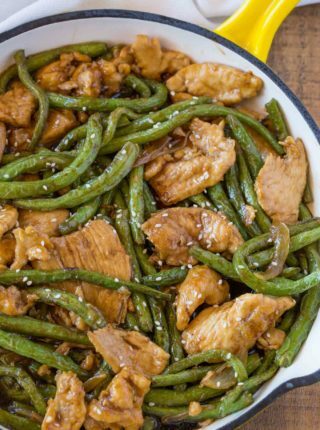 You can see more information from Weight Watchers or you can check out my list of the 200 0-point foods Weight Watchers has rolled out so far. What’s the difference between smart points and freestyle points? Smart points was the previous plan, which didn’t have as many zero point options. They still technically call it smartpoints but the “freestyle” or FP indicates it is following the 2018 accounting of points. I’ve made these a few times and they are always absolutely wonderful! So flavorful! So glad you enjoy the recipe, Lisa! Oh my goodness that is so sweet! Thank you so much for coming back and telling me how you all enjoy it! 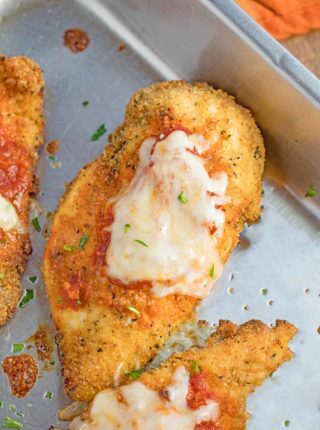 My oldest loves this recipe too but didn’t give it such a fun name! 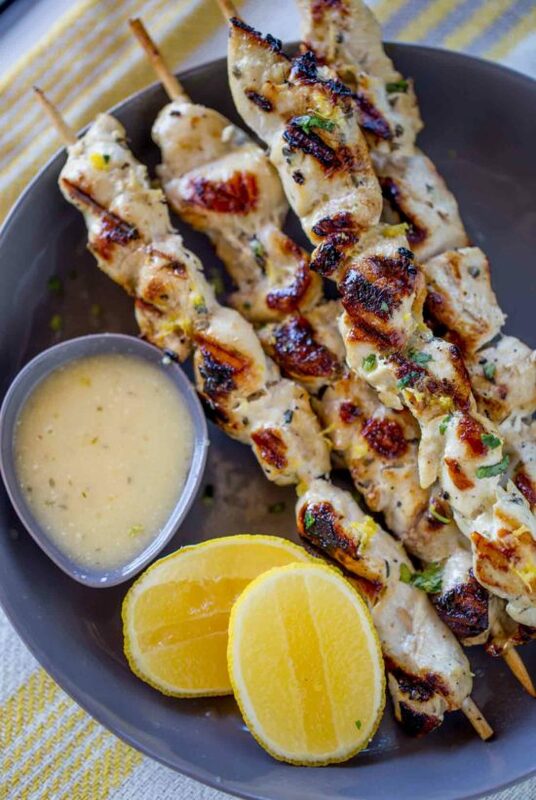 These Greek chicken skewers are seasoned with plenty of lemon, oregano, and parsley, which are traditional in Greece. I like to serve my skewers (souvlaki) with tzatziki, which gives it a refreshing tang. 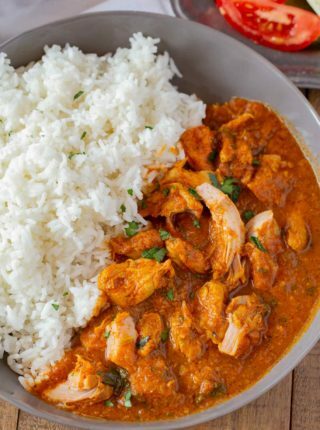 Could you put in the marinade in the morning and then cook after work that night? Or is too long in the marinade? I wouldn’t suggest marinading with lemon for more than a couple of hours. The acidity in the lemon will start to “cook” the chicken like it would in a ceviche. I marinated this recipe for about 10 hours once and it came out fine. I too was worried about the lemon “cooking” the chicken, but the dish came out as good as ever. If cooking in the oven what temp & how long? Cook at 375∘ for 20-25 minutes.